The recent expose on Carte Blanche about UNISA has shocked students to the core, with Facebook and Twitter abuzz with angry and upset students. It shows several students who were unhappy with their marks, and who followed this up relentlessly until they got confirmation of some pretty large mistakes. In every case they had to fight the university to get this recognised; sometimes for as long as 6 months! Carte Blanche has since removed the video. Many students are upset by the expose, saying that it is showing their university in a bad light. Errors will occur, and Carte Blanche has done a shallow and sensationalist piece designed to stir students up. Now, I fully believe that every university will make mistakes, and as UNISA is that much larger it will have a much larger number of them. My problem is not with very human mistakes – my problem is with the fact that there are not the right processes in place to help students when these mistakes happen. UNISA’s strategy appears to be to make it so hard to do anything about it that most people give up. The number of students who are coming forward on our Facebook page saying they believe they have experienced the same problem is testament to this. My personal hope is that the Carte Blanche expose of UNISA motivates students and UNISA to find a real solution to this problem. It is our university, and it is our futures that are at stake if these problems continue. There have been some great suggestions by the students as to possible solutions. They say students should able to properly engage with their lecturers should they not be happy with their marks. Also, marking rubrics should be easily available so students can understand the marks they have been given. And my personal view – students should have a clear and transparent process to follow should they feel they still have not been given the mark they deserve. Could MyUNISA not be used to better effect to facilitate this? I think CONSTRUCTIVE criticism is always good, and I hope that this expose is the start of some real pressure on UNISA to ensure that they come up to scratch and start communicating with students. At Together We Pass we believe that keeping in touch with students is our NO 1 priority, and I wish UNISA could try to up their game a LITTLE bit in this regards!! 21 Responses on Carte Blanche expose of UNISA seriously shaking student confidence"
There a lot of areas where UNISA need to up their game expecially their communication channels. They never respond to any queries. That is true Thamsanqa. What would you suggest they do? Lectures are not responding or interactive on discussion forum especially Geography modules. Not directly related but from personal experience, the marketing department is a train wreck. They are constantly updating the prescribed textbook but not the Study Guide that goes along with it. Whole sections are not being covered as a result. Their explanation is that there is much red tape & the new textbooks don’t arrive before the SG goes to print. Ironically, the authors of these textbooks are often the lecturers themselves. In fact, the head of the Marketing Faculty; MC Cant is either an author or editor of the majority of prescribed marketing textbooks. Very disappointed with the standard of education and yet the prices go up every year. Ive had so much issues in the 3 years that Ive been at UNISA. The most pathetic service ever. Issues with materials, stuff don’t correspond, the list goes on. The UNISA text books are very badly written, and in the end I mostly buy other text books to aid me in my studies. Sad to say but I will just finish my qualification and never study at UNISA again. I need a study group for pyc3705. im indeed need it please. I would also like to throw in my 10 cents worth! Yes Carte Blanche likes to stir things up. But face it, the students which they had on the program were wronged by Unisa. I like studying through Unisa, because Unisa is more flexible than non-correspondence universities. And I also like to see when someone from those other universities tries their luck with a Unisa exam and is surprised by the high standards of my courses. It makes me feel pride. Because I know that every exam I wrote and passed, was a pass in ALL the work for the course. There are no half-measures there. So it is something to aim for because it is not to be taken for granted. All that being said, the service Unisa offers can and should vastly improve. If you advertise a service at your regional office, or on the internet, then back it up with the real thing. For instance: I’ve been looking for tutorial classes in my region for years now, and was very happy when I saw it being advertised somewhere around 2011 on My Unisa. I went to the regional office and even registered for the classes which they told me would be available. There was a registration form specifically for these classes. I registered for all the modules I enrolled for. Only to be told a couple of weeks later, on the day the classes were supposed to have started, that there were no such classes available at Unisa in my area. Why then not tell me? Why string me along? What’s the point? The same thing with all the accounting modules and discussion groups. Wouldn’t it be nice to go and sit in one of those very nice new lecturing halls at one of Unisa’s campuses and actually have discussion classes in the modules I’m taking. But they do not happen nearly enough. In my third year courses, where these discussion classes can mean so much, they are either cancelled, or rarely take place. And then, try and email the lecturers in ANY module, and time their response if you dare. I’m still awaiting feedback from my first year (which is six years ago!!). I even have the sent mail to prove it! If it is the policy of lecturers not to reply on emails from students regarding questions on the work, then WHY do they give email addresses for each module, sorted according to the relevant semester, in each and every tutorial letter 101? Why bother if you’re not going to provide the service? It’s close to insulting if you think too long on it. Don’t phone also, because the last time someone picked up the phone at Unisa when I called, was back in 2007. And yes, I did phone after 2007! It’s like phoning an obscure government department. The phone just rings while you listen to your precious life leaving you. So Unisa is not a contact university. No problem with that at all. But Unisa in essence is a very unapproachable institution. And if you are unapproachable in nature then you should be an excellent communicator if you don’t want people to resent you. Everything is fine and excellent, except for when something goes wrong. Then we as students are very much on our own. I have always had the impression that Unisa do not want to be bothered by students, and that our problems are not very high on their agenda. The biggest reason for this thinking is not the poor administration (my Unisa sorted that out for the most part). The biggest reason for this is that Unisa is the ONLY tertiary institution that I know of, that does not have supplementary exams in February or July. And the same with remarking exams, which also has a six month waiting period. If I had the opportunity to write my supplementary exams in February or July, as opposed to waiting six months for the next exam period, then I would surely have had a better chance of passing any of them. I never pass a supplementary! Because there is no required work to be done during the semester and who studies for something you’ve already studied for? You just have to arrive at the exam hall, six months after you were supposed to have passed it the first time, and then wait yet another two months to be informed that you’ve failed and would have to do it all over again. Time-wise, this is now an 18 month investment of your life chasing one module. Unisa as an institution should respect their students’ time. If it was difficult passing the module in the first instance, why would you make it more difficult to pass the second time around by offering NO support to these students at all? If I were a Witsie, I would walk up to the prof and ask what his problem was. He would take a look at my paper and tell me. For Unisa I have to buy back the paper, and with NO memorandum available to measure my answers against I would have to accept defeat anyway. We also wait for our marks, and every year we wait a day or a week longer. And then you get the marks and on more occasions than not, something doesn’t feel right. But this is only a feeling and who am I to say I did pass when Unisa is saying but I didn’t? In the end, it will only be me and the tutorial letters with all the errata in them which is going to determine if I pass or not. So I recommit and start again every time. That would still be fine, if Unisa would make a bigger effort regarding contact and communication directly to their students. Why don’t we have module facilitators which can act as go-between for lecturers to students. Unisa sits with each and everyone of their 400,000 plus student’s email addresses, why don’t we have facilitators who can answer our questions and help us stay on schedule etc etc etc. It’s not pie in the sky either. I am willing to pay, in Rands and in Time for a service I desperately need. In 2013 first semester, I drove 400km each weekend to Jhb to attend lectures at an independent tutorial service. All the while working a 50hour plus week as an article clerk to satisfy the other requirements of my chosen profession. These people are qualified in their fields, taking advantage of a gap in the market, since Unisa is apparently unwilling to do it themselves. Other campuses at other universities have facilitators for each and every module they present. Why not Unisa? 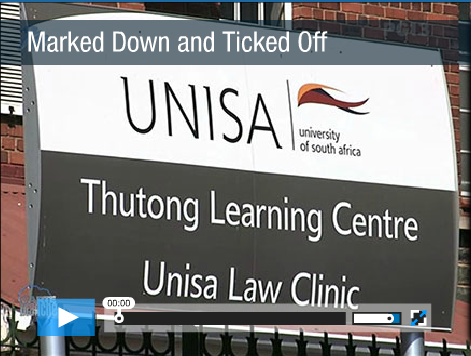 The internet and My Unisa is a wonderful tool, and Unisa is improving with it as time goes on. But I’m still waiting for the day when I can go on My Unisa, and download a video session for accounting on IAS 16, or see a presentation on group financial statements and SEE what the damn lecturers want me to write down in the exam, as opposed to reading it in endless never-ending high brow academical jargon in a very impersonal, drab, study-guide, which I have to read and reread numerous times before even knowing what this person, whomever they are, are supposed to be trying to tell me. 120hours required to read and study through a study guide is a load of nonsense. I’ve never been able to do that, even when trying my utmost. And this is where you will just have to BELIEVE that I am sincere in that statement. I download lots of videos for content I am supposed to be able to already access for the modules I pay for. And I long for the day when I can tune into a video session via SKYPE where a facilitator is busy calculating on the screen the exercises in the study guide. I’m not saying that I want to be fed with a spoon everything I have to be able to do, but what I am saying is that with learning being the process that it is, and with universities understanding the problem of learning and presentation of knowledge like they do, shouldn’t something more be done to ensure that the students enrolled are helped along in a MORE constructive manner? And that’s all I have to say about that!! This is my fourth year with UNISA. Yes, I have also had issues but every phone call so far resolved my issues. UNISA best value for money university!! My 10 cents worth: Unisa send a lot of envelopes, mark reading sheets, additional information and extra paper for us to do assignments on without asking if I need it or if I am going to submit via MyUnisa. I would love to know what the saving would be if they stop sending out unnecessary stationary – and rather use this money to optimise their processes/employ more staff to assist students. I have access to a computer and can read up online. Might be worth while for them to investigate. One year down the line and not a thing about Unisa has changed. Unfair marking still goes on…a growing number of disappointed students. I have got a painful experience with regard the marking of my work at UNISA. I am shocked to find that this problem of marking at UNISA dates back to 2013. I give the UNISA credit for putting in place an opportunity for students to apply for their examination scripts and would be very happy if processes to rectify mistakes in marking by markers are quickly adhered to in all cases in fairness. I think its time that Carte Blanche starts all over again with UNISA’s exam marking. Plenty of students are complaining about how unisa exam markers allocate marks. I am so discourage because i was supposed to be finishing my degree now; only to be allocated a mark that i know that on earth i would not get for that particular module. even in the past semester i had the same experience; and i did not pursue it because i thought of a hustle it was gonna be to get assisted considering the poor processes at that university. Write now i am ready to take it further. This university’s incompetence hinders us from obtaining our qualifications. Last semester students who had failed mng3702 were granted a supplementary automatically just in the middle of second semester; and unisa did not do anything about students who had actually obtained a supplementary from that exam. if they suspected their marking was not proper; then it should have also applied to students who got a supplementary and promoted them to a pass; because they promoted those who had failed to a supplementary. Im a first year student, the service of Unisa really is pathetic. Wating for study material for two months.If you try to contact the Universarsity you simply cannot get through,If i had know what lies ahead for me with this service,i would have never decided to study at Unisa.You pay your study fees,to think that a person must spend more money making copies of the study material.This is stealing and corruption.When will this ever stop? I am in my honours year…I am VERY happy with Unisa. I think the standard us improving and I always find the lecturers helpful. FACULTY OF EDUCATION.